Chandra X-ray Observatory image of the galaxy cluster Abell 2142. 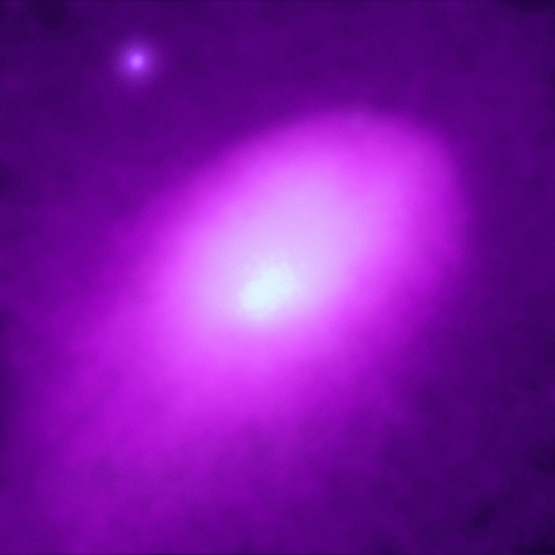 The image shows a colossal cosmic "weather system" produced by the collision of two giant clusters of galaxies. For the first time, the pressure fronts in the system can be traced in detail, and they show a bright, but relatively cool 50 million degree central region (white) embedded in large elongated cloud of 70 million degree gas (magenta), all of which is roiling in a faint atmosphere of 100 million degree gas (faint magenta and dark blue). The bright source in the upper left is an active galaxy in the cluster. Abell 2142 is six million light years across and contains hundreds of galaxies and enough gas to make a thousand more. It is one of the most massive objects in the universe. Galaxy clusters grow to vast sizes as smaller clusters are pulled inward under the influence of gravity. They collide and merge over the course of billions of years, releasing tremendous amounts of energy that heats the cluster gas. The smoothness of the elongated cloud in the Chandra image suggests that these sub-clusters have collided two or three times in a billion years or more, and have nearly completed their merger. 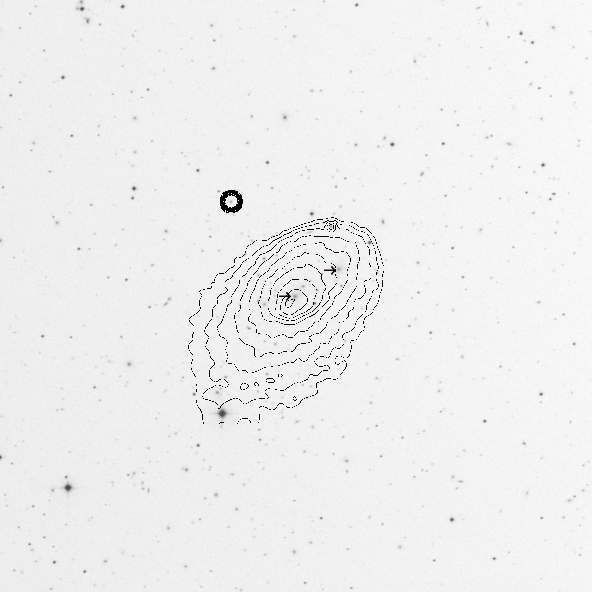 Scale Image is 7.5 x 7.2 arcmin across. Coordinates (J2000) RA 15h 58m 19.80s | Dec +27° 13' 45.00"